The Pipe Snake is driven through the pipe by three independent drive units coupled together. 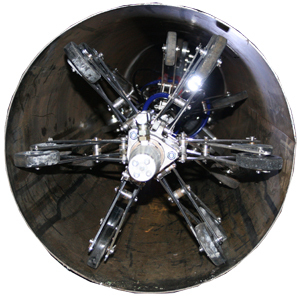 Each drive unit has independent suspension that allows it to automatically adjust to the size of the pipe. This mechanism uses a design which guarantees that the drive unit is always on centre line of the pipe. The Pipe Snake’s head unit can accommodate many additional forms of attachments that can be mounted on the front of the snake, such as a repair tool to fill holes and mend pipe joints, a grinding tool for preparing a refined pipe surface for coating, to a video camera for internal inspection of long complex pipe forms. Future enhancements contemplated include a laser optic measurement system for more accurate measurement of pipe wall thicknesses.